I love cheese (seriously, it’s an addiction) and I love creme brulee. 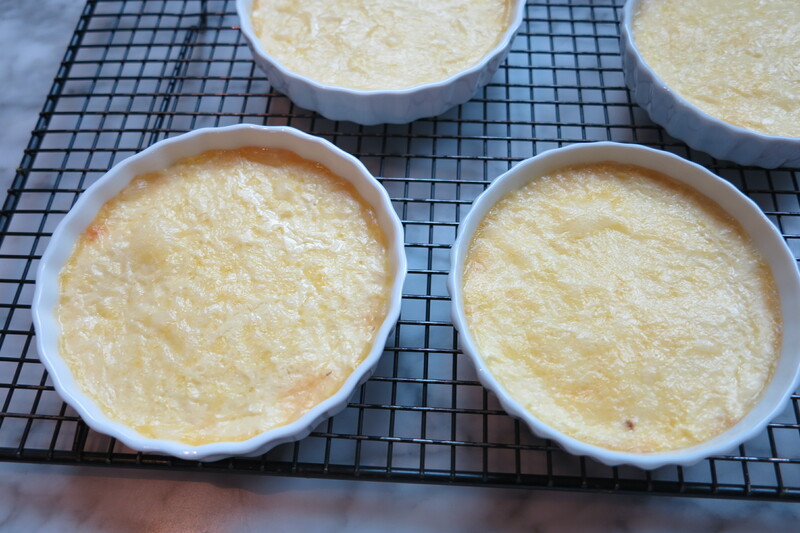 But this week’s French Fridays with Dorie recipe, Cheesy Creme Brulee, just wasn’t pulling at my culinary heart strings. Sometimes I get excited about the weird-sounding recipes (I was all on board with Olive Oil Ice Cream), but this one wasn’t doing it for me, and I just kept finding reasons not to make it until, lo and behold, it’s Saturday and I am officially late. Because Ei said that she found hers to be a bit greasy, I decided not to butter the ramekins. I don’t seem to remember ever buttering my ramekins when making classic creme brulee, so I reasoned that it should work here too. And it did, no butter needed. I shredded my cheese instead of cubing it, with the result that my cheese wasn’t really heavy enough to stay put on the bottom of the custard, but instead incorporated itself into the cream as I poured it over. I turned up the oven temp to 250°F, because I am not a famously patient person. That may have actually been a bit too high because they were bubbling a bit when they came out and had already formed a bit of a crust on top, but they set up nicely and the consistency was perfect. And finally, I left my kitchen torch in the cupboard and used the broiler to “brulee” the cheese. 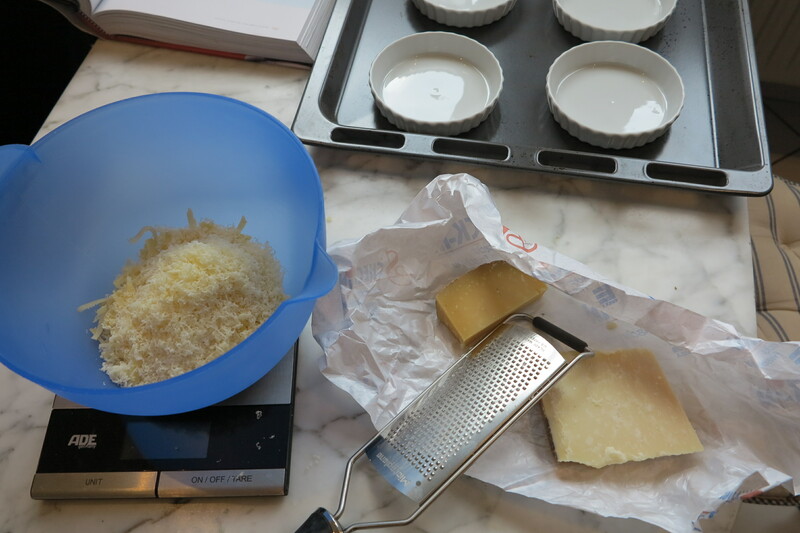 But with all those mini-alterations, I did stick with Dorie’s recommended cheeses: parmesan and comte (a personal favorite). In the end, I’m still left confused by this dish. It was quite rich and definitely needed to be paired with something to cut through that. Dorie suggested Champagne and I decided not to argue with her. It didn’t taste bad; really, could a mixture of cream and cheese ever be bad? Maybe I just lack the imagination needed for this kind of dish, or maybe I need to throw more multi-course dinner parties, but I wasn’t convinced. This entry was posted in french fridays with dorie and tagged Around my French Table, eggs, starters. Bookmark the permalink. Rose, I was also confused by this dish! Perfect for a dinner party…but give me the classic sweet Creme Brulee anytime!! Yours look quite pretty! Well, it certainly looks lovely! I know that there are some recipes that excite others that leave me feeling ho-hum (anything involving liver or veal, let’s say…). Hope next week’s recipe is a bigger hit! Yay – you made it! I liked this but was not inspired in the least until I tasted it so I understand where you are coming from. I had fruit salad, champagne and tossed salad which definitely helped cut through the richness. I wasn’t excited to make this, but really enjoyed the end result… We had leftovers for breakfast and it worked well. Another option to a multi-course dinner. I vote for more multi-course dinner parties, but then, I enjoyed this dish quite a bit. 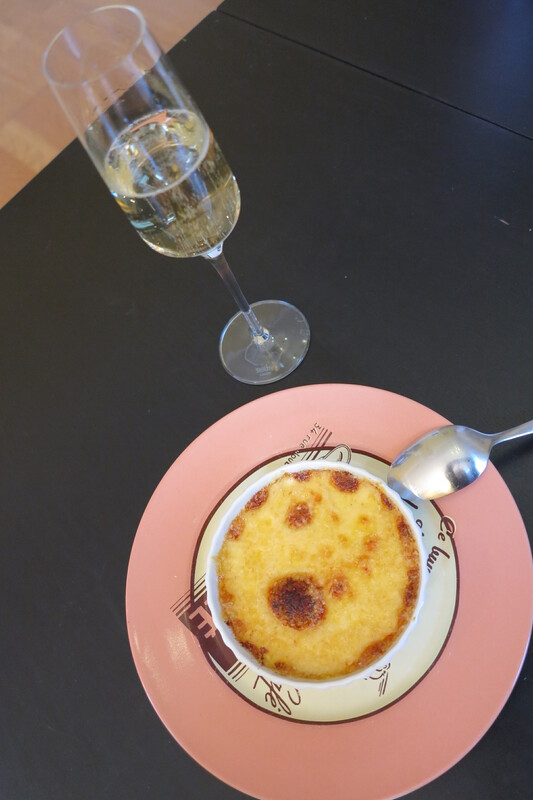 Rose, your Cheesy Crème Brûlée does look lovely though even if you were not 100 percent convinced that you actaully liked this recipe – it was a rich custard and I am sure that it was wonderful with a glass of champagne. We liked this as an appetizer but I see this as a “savory dessert” at a dinner with friends who prefer cheese over cake for dessert. I am glad I read your post. I am late, lol, I will be cooking this at the end of the month as I inadvertently followed the voting list recipes and therefore made the spinach this week. But like you, I have been noting all of the tips and comments that others posted. I will be adding yours–no buttering of ramekins. And then you said it still needed something….and I wonder if it’s a crust. What do you think? I struggled with what to pair this with but ended up liking it in the end. It was kind of a weird one though. Yours look perfectly browned and deliciously crunchy on top though! I really liked this one, but I’m not sure I would make it again. I served mine with salad, which helped cut through the richness.